Chipper tube that will enable 65mm (2½”) material to be chipped. 5.5mm thick chipper blade made from a special high quality chipper-blade steel. 3mm flail blades made from tough blade steel to quickly break up material. UV resistant polyethylene moulded hopper that absorbs noise and will not rust. Heavy-duty cutting chamber designed to self-feed material through the machine. Belt drive (as opposed to direct drive) to protect engine from damage. Large rear wheels (230mm) puncture proof and wide enough to handle uneven terrain. Front discharge for ease of collecting mulched material. Simple to clean with easy access to the mulching chamber. 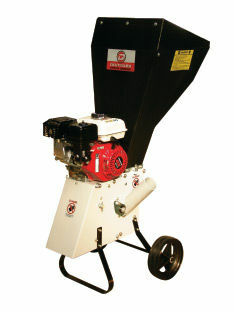 Solid steel pulleys to handle the vigorous action of a chipper shredder.